Trimwork includes a gable truss on brackets, bargeboards, and exposed rafter tails under the porch roof. 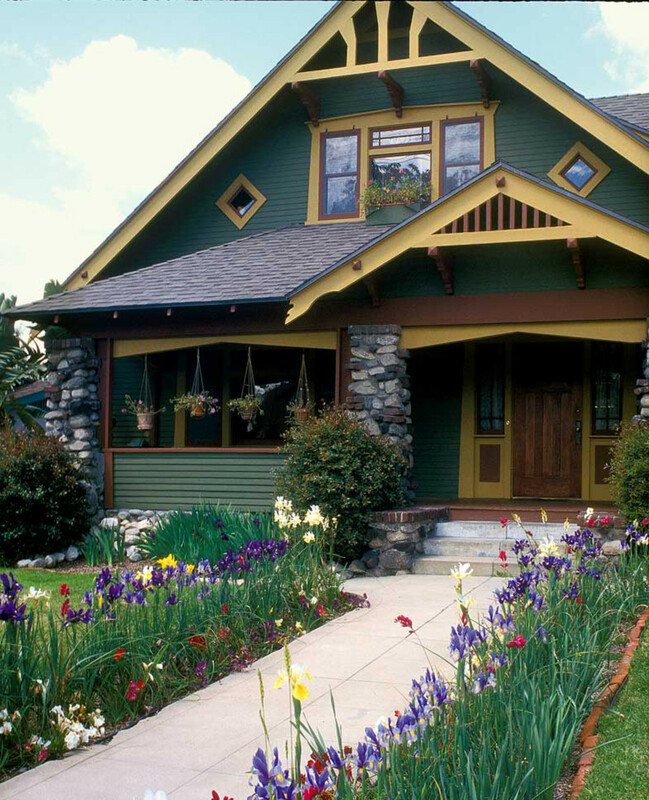 If the front of your bungalow or chalet-like house seems to lack character, there’s a good chance it is missing wood trim that once ornamented the gable. 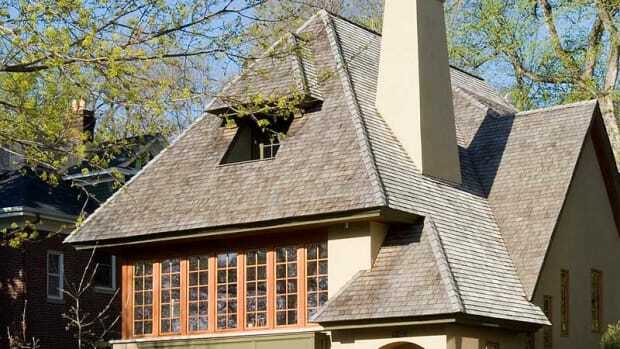 Near the roof is where the action is when it comes to Arts & Crafts exterior style. 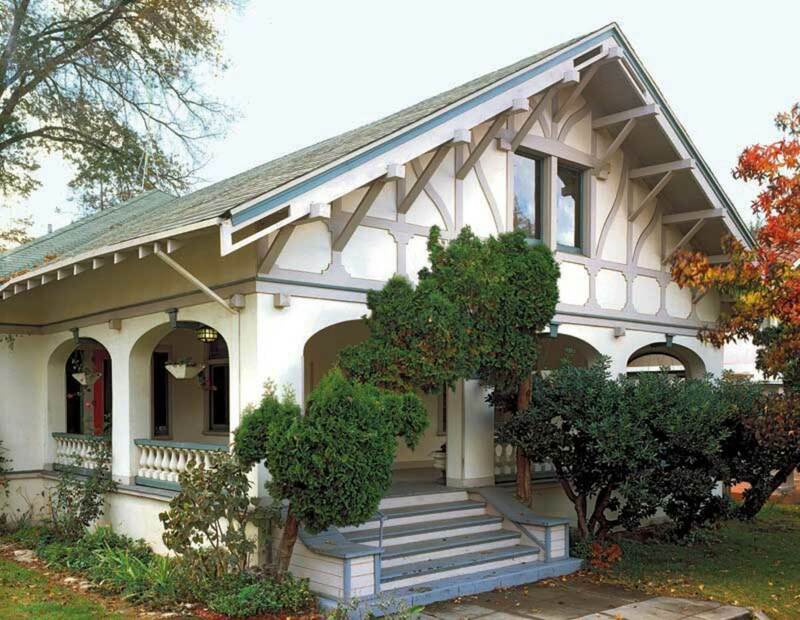 Typically low and with a deep overhang, the gable is an ideal stage for all kinds of trim, from carved brackets to gable-peak trusses, decorative bargeboards, and rows of Arts & Crafts-specific pyramid-end blocks. A closeup of the roof edge shows the saw cuts, joinery, and gutter system. Exposed roof-rafter tails, their ends finished in cuts limited only by the imagination, lend rhythm in the eaves. Even a lowly ventilation cover on the gable face may be decorative as well as functional. Almost all of these elements are cut out of wood. 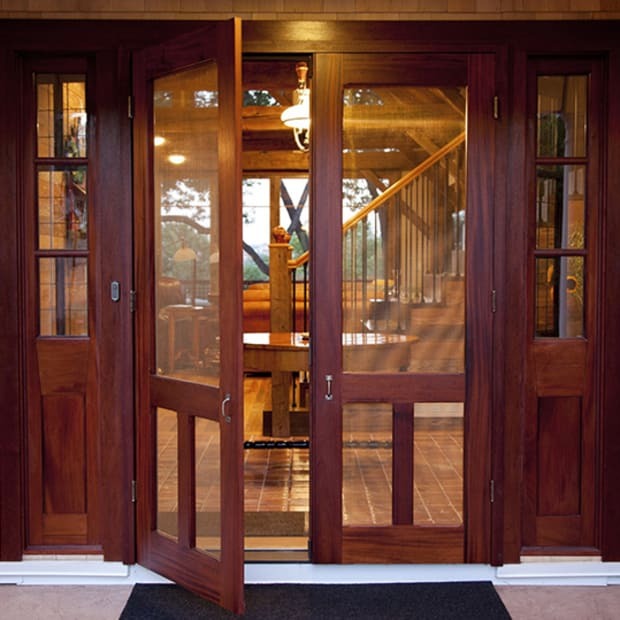 The bad news is, wood rots and that’s why your trim may be missing. The good news is, replicating such trim is straightforward, provided you have at least one example of what’s missing, either from your house or a neighbor’s. If no models exist, a little research will turn up trimwork typical of the era for you to copy. In this era, ornamentation looks structural. Adding a bit of trim adds period charm to a plain or stripped façade. Knee braces are doubled in the gable peak; note widely spaced dentil blocks. 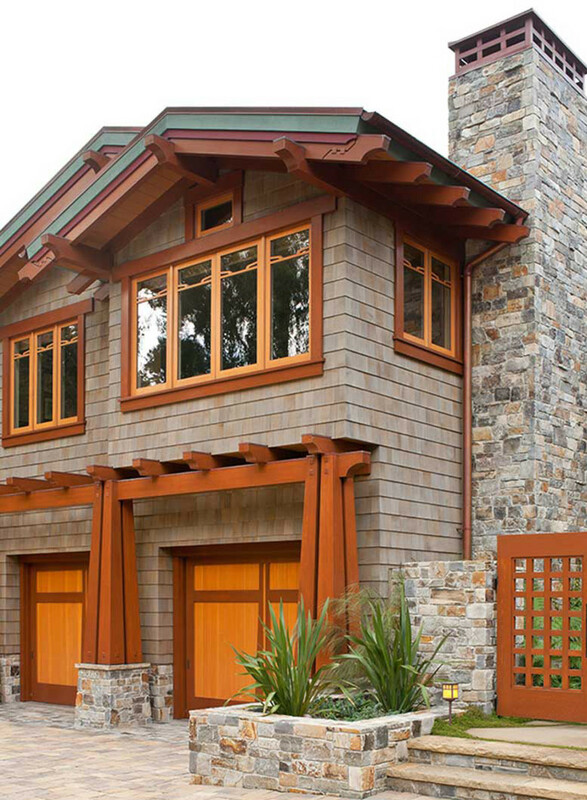 These elements play a supporting role under the roof, cornice, balcony, or other overhang. A bracket is any projection that provides structural or visual support. It may be a solid console bracket, or an open, triangular knee brace. The word corbel originally referred to masonry built out from the vertical surface to support a cornice or oriel, but in this period a corbel is any large decorative bracket, even one made of wood. While a corbel may appear to be a solid block, it’s usually built up of several thicknesses of lumber glued together. Some feature hand carving. 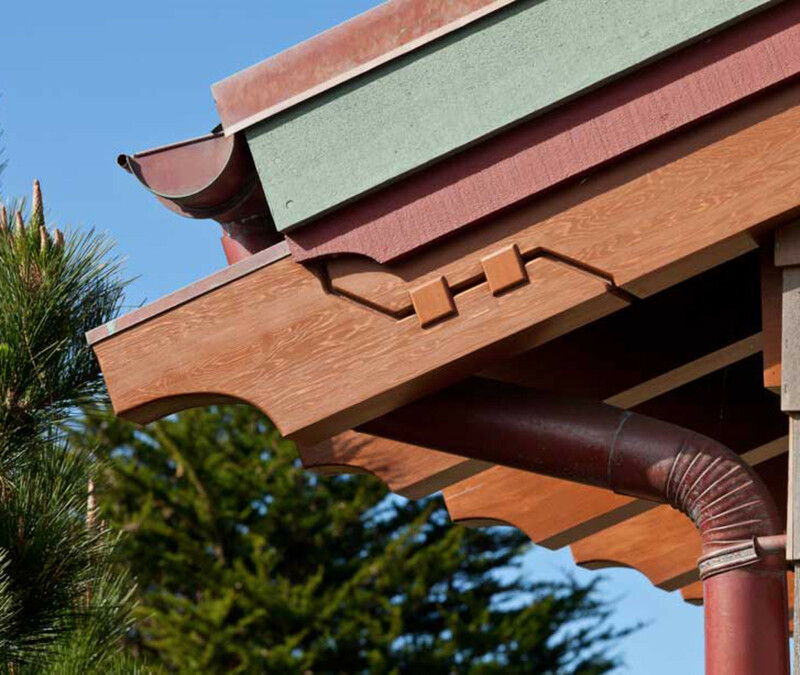 If the corbel is especially intricate or will be vulnerable to weather, it may be worth considering having replacements made from a composite material or moulded high-density thermoplastic. Whenever brackets and corbels are used, multiples are common. 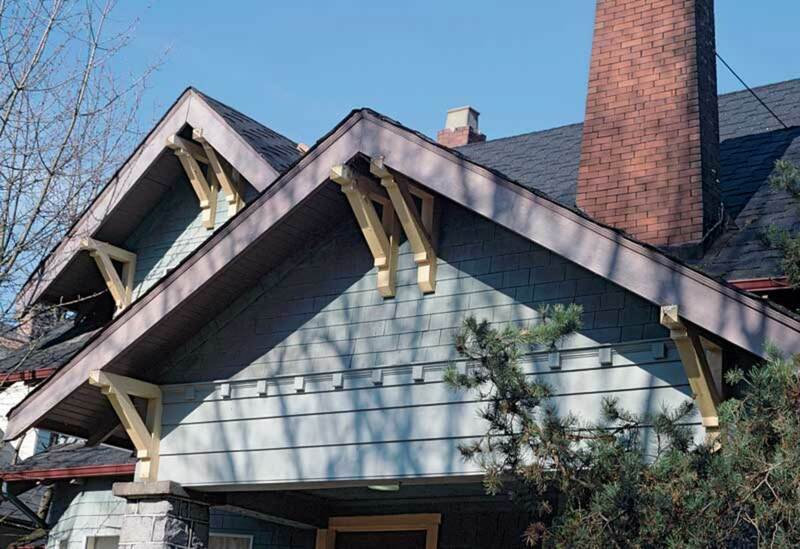 Brackets accenting the roof are usually installed in threes or fives, evenly spaced in the gable, with one at the peak. Brackets may also be doubled. Archaically called vergeboards, these are flat, carved, or ornamented boards attached along the edge of the roof. 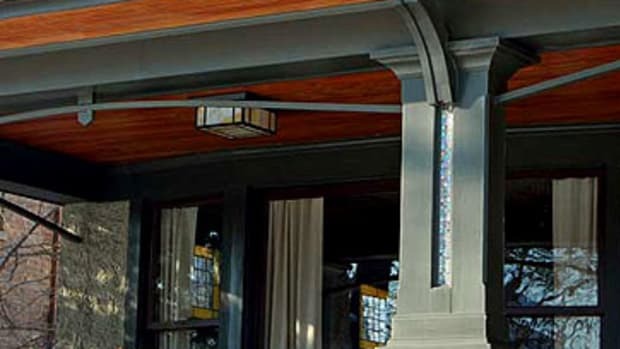 Most bargeboards on Arts & Crafts houses are plain, but ornamental, scroll-sawn variations are found on related styles like the Swiss Chalet. A bargeboard often ends with a fancy saw cut. Fancy “half timbering” on the chalet–bungalow is accompanied by an elaborate use of knee braces and a notched bargeboard. Cross-braced trusses, sometimes held on brackets, fit into the peak of the gable. They may be decorated with curved, sawn, or vertical elements. Although they look structural, they are often purely decorative. In a porch gable, vertical slats do have a purpose, providing both shade and ventilation. 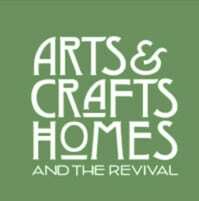 Elements familiar from classical and medieval architecture get a “modern” look on the Arts & Crafts façade. Rather than a row of tightly spaced “teeth,” however, blocks are usually spaced farther apart. And the outward face is often cut into a pyramid shape, a familiar period motif. Extending past the roofline, these decorative sawn boards may or may not be the actual ends of rafters that support the roof. Historical patterns range from straightedge cuts (that look like the end of an X-acto blade) to notched or rounded ends, including cuts that resemble a clothespin and a bottle-cap opener. To add rafter tails to the roofline, choose a historical style from a millwork company, or design your own and have them sawn. On a ca. 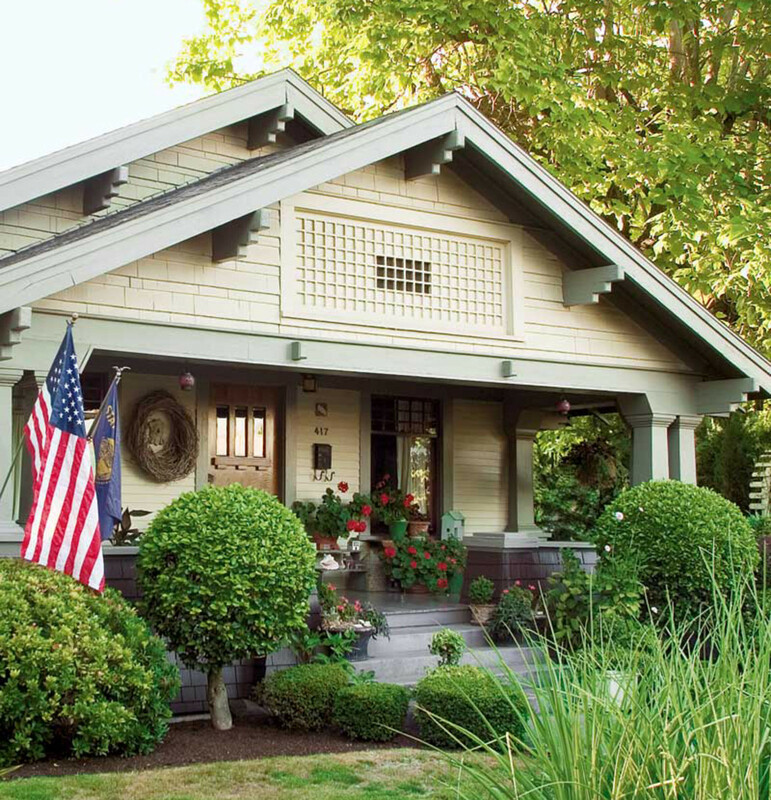 1915 bungalow in Oregon, the ventilation opening is concealed by a framed lattice-work scrim; the ziggurat shape of the brackets suggests corbeling. Simple scrims resemble the stock latticework still sold at lumberyards. Period examples are usually installed so the slats cross at 90 degrees, rather than on the diagonal. Neatly framed with a wood border, the lattice is usually more delicate than modern examples. Fancier scrims might include a supporting element, like a tiny balustrade. Another form of ventilation involves rows of evenly spaced slats just under the edge of the roofline, common in California. Slats may be painted in alternating colors for a stripe effect. Comparable to historic designs found in period builders’ catalogs, these in-stock cuts for exposed rafter tails are from ProWood Market. Missing trim elements that match originals can be re-created by a carpenter or local millworks, provided you have a model. 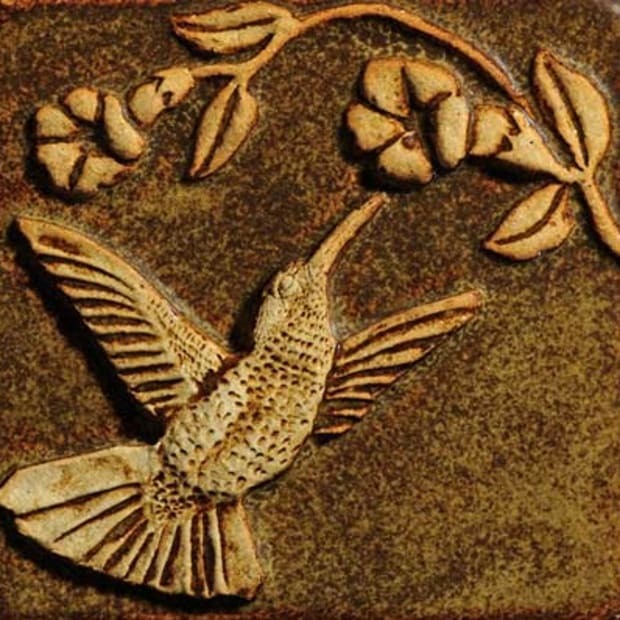 - The woodworker can use an existing element to make a template, as long as it’s in fairly good condition. - If there is damage to the sample—a notch or rotted areas—ask your fabricator to interpret the profile based on historical examples. 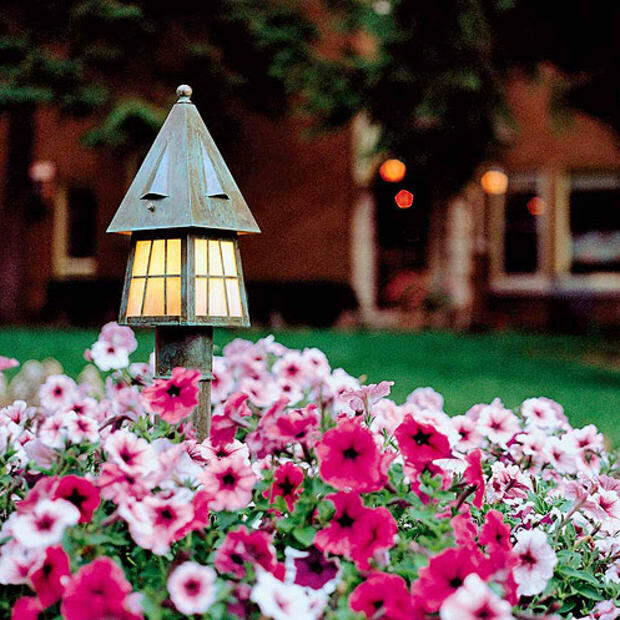 - If an architectural element is missing altogether, look for evidence of “ghosting” on the house. The old pattern may show up as a patch of missing paint, a dirt pattern, or both. - Make a precise tracing of the model profile (or ghosted area) with a very sharp pencil, such as a drafting pencil. Depending on the shape or the element and how easily or awkward your access is, use tracing paper, heavy paper, or cardboard. - Measure the dimensions of all elements of the model to get accurate widths. Include cross-sectional dimensions like recesses and projections.